The wait is over, people! The new taptogo.net website blinked on last week and is now available for everyone’s use. •Users can now apply online for senior, disabled, K-12 student and college/vocational reduced fare cards. •Easier navigation and brighter colors. The mobile validators used on some muni buses. One important note: as in the past, it may take approximately 24 hours for passes and stored value purchases to be loaded on your card if you are boarding a bus. If you are riding a muni bus with mobile validators — see the photo at right — it can take up to one hour for passes and stored value to load. On Metro Rail, passes and stored value can take up to four hours to load. This is an issue that customers have frequently asked about. The tech issue here involves quickly getting data about passes and stored value purchases from the TAP web server to the electronic chip in TAP cards, which are not connected to the Internet. 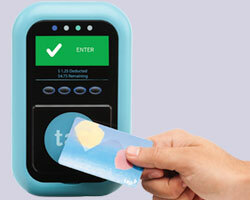 The info is uploaded to TAP cards when customer tap the cards on validators on Metro buses and at Metro Rail stations. The reason it takes longer to upload passes and stored value to TAP cards on buses is that buses are in service on our region’s streets and typically don’t plug back into the internet until the vehicles are back in Metro’s bus facilities for cleaning and maintenance. Metro is looking at some technologies to speed the transfer of info to validators on its buses. Bottom line: If you need passes or stored value to use immediately, please purchase it at a TAP vending machine, which are available at all Metro Rail and Orange Line stations. In addition, you can also purchase passes and stored value at one of more than 400 vendors that sell TAP cards and fares in Los Angeles County. Use this locator to find a vendor near you. Over the past couple of years, Metro has taken over TAP operations, which allowed Metro to finally update the taptogo.net website. As with any new website, it will be tweaked in the coming weeks as more customers begin using the site. Please try the site and give us your feedback in the comments section or on our Twitter or Facebook streams. Error:Se ha producido un error en su intento de inicio de sesión. Asegúrese de que el nombre de usuario y la contraseña son correctos. Another suggestion: put some Tap vending machines at major intersections in parts of town with no train service. The thing I’ve been wanting for years is a way to set up autoloading of stored value. There doesn’t appear to be any way to do it on the TAP website. Essentially, the feature is this: When the value on my TAP card gets below a certain value (say, $5), my credit card is charged and my TAP card is topped up. Problem? Yes, you read that right, you have to CALL in this day age to get autoload set up. Likely expect long waits just to talk to someone that you can do yourself in less than five seconds. Have absolutely no idea why something simple as this can’t be entered in online either and requires customer service assistance. Besides, I doubt majority of people will not be comfortable talking to someone they don’t know over the phone and telling him/her their credit card number, expiry date and the CVC. The same autoload feature is available on Metro ExpressLanes and you can do it simply online and store your credit card info there so there’s no reason why TAP can’t. You have to wonder Metro is purposely keeping some features offline so as to protect government employee (taxpayer funded) jobs from being taken over by internet automation. I wish Metro would put TAP vending machines at least at stations for the Silver Line. I know it can not be done on the streets in Downtown LA; however, it could be at the stations along transitways. I like the idea of auto refill!!! I personally would like the “Device ID” column of the trip history fixed to something more legible like actual bus number, rail station, rail line, transit agency, etc. which it was back in the old website if you managed to learn how to use it. Is there a max to how far the history can be kept? Is it possible to provide an option where people can download a monthly trip history statement via a PDF file? TAP balance transfers was featured on the Youtube video Metro put up to make life more easier for people than having people call to do this, but lo and behold, the feature isn’t available on the live version yet. BE ADVISED – start up glitches with the new web site seems to be causing a slow down in TAP customer service response time to emails. – Due to the old senior card issue process, I have two accounts with the same email and can’t login to one. Case closed by TAP CSR with no resolution! WARNING – this is symptomatic of help desks with irrational ‘close tickets quickly to meet top-down metrics’ goals. Metro, you should be ashamed! – One case asking about previous trip / transaction history was responded to with “We are currently working on getting a fuller broad history of the TAP card for online viewing. ” Not holding my breath …. – ALERT about inexplicably terrible IT design decision – account is tied to your email address WHICH CANNOT BE CHANGED BY YOU. Whatever happened to autogenerated, unique account numbers? Sheesh. Good suggestion about putting TVMs in the mostly semi-secure Silver Line stations. Well, probably not the outside platform next to LAUS. Since Metro has closed most of their “service centers”, how about putting some TVMs in city halls, public police centers, or shopping malls around the county? Oh, that’s right, not Metro monopoly territory. The TAP “vendor” locations have restrictions, like the Hawthorne Rec Center here can only add fare to reduced fare cards; no sales of new cards, etc. Argghh. The cheaper and more logical solution is to just utilize the NFC readers that everyone already has these days: their own smartphone or tablet. In other countries that are decades ahead of us, topping up with a smartphone or heck, even using the smartphone itself is the norm. Saves a ton of money in installing TVMs and issuing non-environmentally friendly plastic TAP cards when practically every smartphone and tablet out there today already has NFC capability. You’ve said the same thing over five years ago. Now it’s 2015. 3G is dead and we’ve moved onto 4G/LTE and it’s lot more cheaper. I think five years is way more than enough time to figure out a solution to this problem. 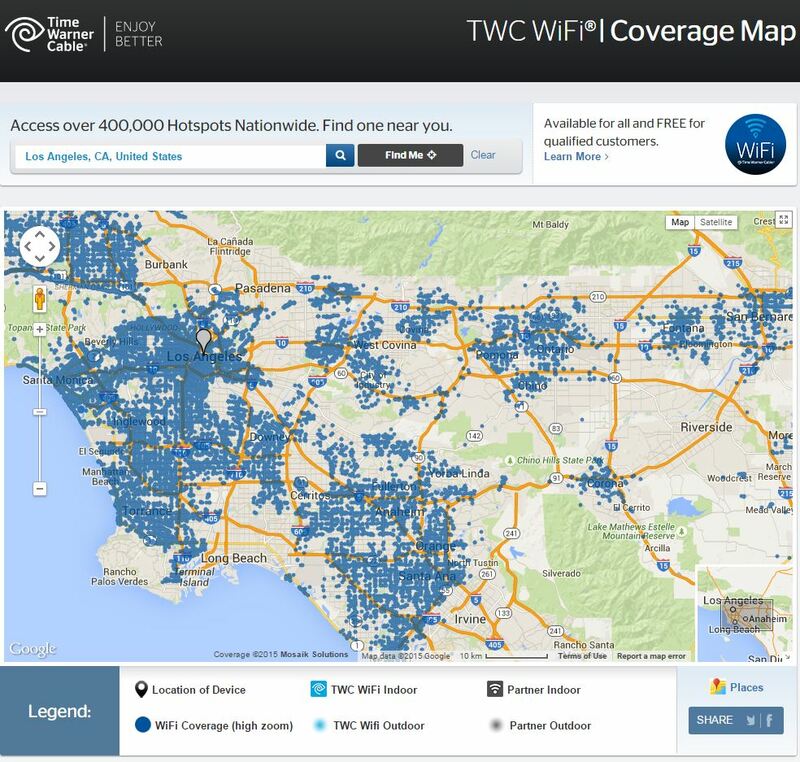 How about a private-public partnership with Time Warner Cable which already has thousands of TWC WiFi hotspots spreadout throughout the LA area, that Metro and Muni buses can use to automatically connect their farebox machines wirelessly so that they constantly refresh with new TAP data as it drives through our streets? Maybe you guys can reach a deal with them, something like allow TWC to install new hotspots at Metro Rail stations and bus stops, and in return, you guys get to use TWC WiFi hotspots for your buses as it travels throughout the city. You don’t need to have 100% full coverage, this itself is way better than your “wait 48 hours” plan that you have today. At least it updates itself as it passes through a WiFi hotspot! Not sure I like the idea of using a public WiFi hot spot as they are easily spoofed. Even worse, TWC does not yet support two-factor or third party (proxy) authentication, or separate WiFi credentials – even business users have to supply the account username and password – Yikes!! Of course, this isn’t your average company we’re talking about. This is Metro with a $5.5 billion annual budget. They certainly can come up with a deal with Time Warner Cable. Besides, what’s a hacker going to do with TAP card information? Stealing bus passes? Gimme a break, they’re more interested in stealing credit card numbers that can be used in Romania or some other shady Eastern European country, not TAP credit that’s useless except to ride transit in LA. Agreed. There’s no reason why you can’t just do stuff like automatic reloads, balance transfers, changing e-mail addresses, or have the funds activated in real time. Making techno mumbo-jumbo excuses may have worked for previous generations who are more clueless to technology, but you can’t BS your way out of the techie generation who knows their stuff. Who do you think our moms and dads come to when they have problem with their computers? It’s us! If it is any consolation, the Clipper Cards in the SF Bay Area also function this way. Allow time for the data to get the readers when adding fare online. I get your point and I believe the agencies are trying to close the gap. Mobile TAP does have a point on that Metro could just utilize Time Warner Cable’s hotspots that are scattered throughout this city. It’s not exactly a real-time solution, but it can drastically reduce updates to the farebox on buses from 48 hours down to probably only 30 minutes as it runs through the city everyday, which is fare more acceptable levels. Two days wait is too long for an update, 30 minutes, not so bad. It’s not like people are going to fares into their TAP cards at home or work and few seconds later they’re waiting at a bus stop. The more likelihood is that they’re doing it during lunch time, at night, and by the time they need to use transit after work or the next morning, it should already be updated. Or, just enable paying for bus fares with Apple Pay and Android Pay (formerly known as Google Wallet). If the problem is buses can’t have internet connection, the next best thing is to use the internet connection everyone already has in the palm of their hand. So what’s it going to be Metro to do all these things people are asking for? Another five years of waiting? Yes, yes, yes, I know the usual unsympathetic bureaucratic answer: “we don’t have a timeline.” Pfft. Bureaucrats, so predictable because they give out the same answer everytime they want to avoid answering the question and enjoy collecting their paychecks regardless how poorly they do their job because they have a secure job that they know they’ll never get fired, just like that Kentucky clerk who refused to issue gay marriage licenses. Too bad the new web site doesn’t work very well. I added stored value $ to my TAP card last Monday. I got an email receipt and my credit card was charged. However, now it’s Sunday and taptogo.net still shows my TAP as having a stored value of $0–when it shows my card as existing at all. Sometimes when I log in, I get a message that I have no TAP card and that the “site is experiencing a heavy volume” This is the new, improved web site? Where’s my money? The TAP website is stupid that it doesn’t tell you when your funds that you added are available. You need to PHYSICALLY, go to a TAP card reader (bus, TVM, retailer) to have those funds activated. Only then do you get to see the funds added to your card online. Don’t ask me why Metro chooses to do this way. No other reloadable card system in the world works this way. Like people have been saying, loading a Starbucks card makes more sense than TAP. Your government at work.